One of my favorite things about being in aesthetician is working with many of the same clients’ faces over the years, and seeing not only how their life progresses, but also their skin! These long relationships have also let me see the crucial importance of using the right products at home, to maintain results in between professional treatments and improve any issues we are working on. I only get to work on my clients once every few weeks, but their products are there for them every day. The daily ritual of a proper skincare routine is a healthy step in self care. But let’s get real; our weeks can sometimes get so busy that we haven’t spent enough time taking care of ourselves, and our skin. Self care is all about giving yourself moments that can improve your self-esteem, mood, and overall well-being. I encourage you to put aside a few minutes on a Sunday (or whenever you have some downtime) to give your skin the little extra love it needs. One of my favorite ways to do this is weekly exfoliation with an at-home peel. So many factors that are constantly changing (weather, stress, etc.) will absolutely affect our skin temporarily, but that doesn’t mean we should change our whole routine. This is where exfoliation comes in to solve almost every issue — really! Our skin’s ability to shed dead skin cells slows down over time. Regularly exfoliating will reveal healthy new cells, and can unclog pores, minimize the appearance of wrinkles, smooth out rough texture, even out skin tone, and boost hydration. An easy way to deeply (but gently!) do this at home is with Alpha Hydroxy Acids (AHAs) in the form of an at-home peel. If you are unfamiliar with using acids at home, ditch the notion that they are scary or too intense for you. We aren’t using those kinds of acids. The AHAs used for at-home peels are mild, gentle, and can even be used the day before a big event — there is no visible peeling involved! I see all the time firsthand the impact a weekly at-home peel can have on my clients’ skin. Plus, the actual act of spending a few extra minutes on yourself is comforting and soothing by nature. 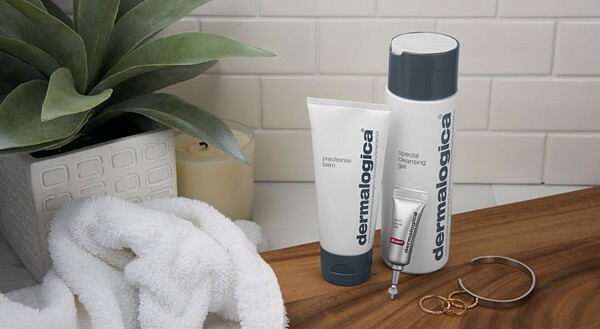 I have been absolutely loving the new Rapid Reveal Peel from Dermalogica for my weekly exfoliation ritual. It’s such an impressive formula! Not only does it incorporate well-researched AHAs in the form of Lactic Acid, Citric Acid and Phytic Acid, it also uses a fermented plant enzyme to kick-start cell turnover. In addition to exfoliation, this at-home peel uses a unique blend of humectants to hydrate along with soothing ingredients to calm and nourish the skin, making it ideal for all skin types. After I rinse off the peel, and while my skin is still damp, I’ll apply a hydrating serum with Hyaluronic Acid, like the Skin Hydrating Booster, to deliver moisture into freshly exfoliated skin. Finally, I’ll take a few moments to massage in Intensive Eye Repair, an ultra-rich eye cream. This weekly exfoliation fits right in to a self-care moment, and will reveal your most radiant skin! Licensed medical esthetician and sought-after beauty expert, Jordana Mattioli, has been tending to faces since 2001. Her high-tech facials use the latest anti-aging technologies, techniques and innovative products to create results-oriented treatments for each client. She performs a wide range of skin care treatments through private appointment in Manhattan within the dermatology practice of Complete Skin MD.